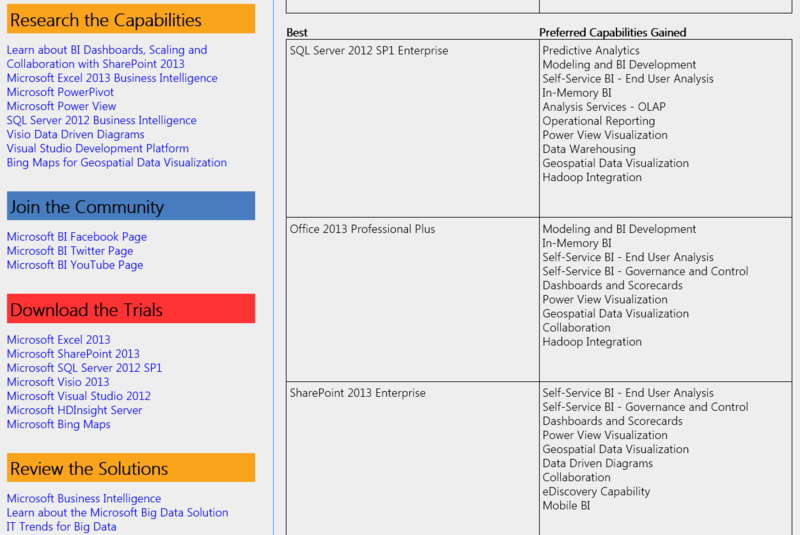 In the case your organization need to plan for BI deployment or upgrade, you may use the BI Solutions Builder tool at www.bisolutionbuilder.com. This tool allows you to understand which products to need in attrition to existing products in the organization to get a desired BI solution. To use this service you need to enter some basic information about your company or organization. 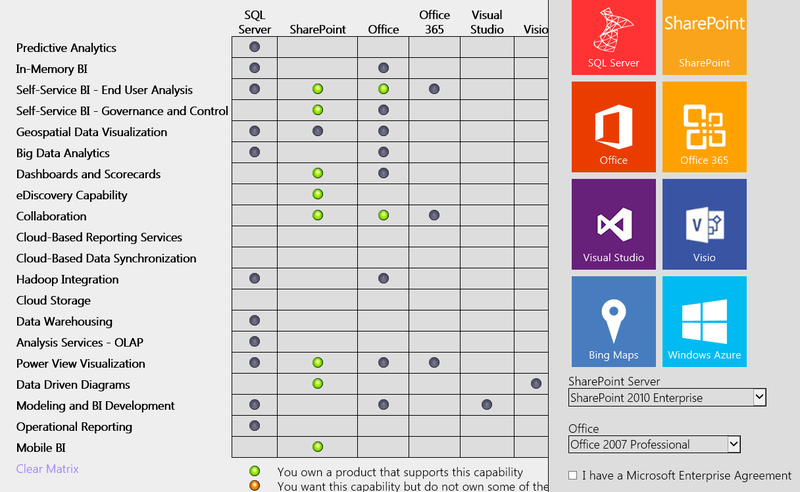 On the first step you should select products which you already purchased (for example on the screenshot below there are SharePoint 2010 Enterprise and Office 2007 Professional without Enterprise Agreement). On the second step you should choose desired capabilities from the list: Predictive Analytics, In-Memory BI, Self-Service BI – End User Analysis, Self-Service BI – Governance and Control, Geospatial Data Visualization, Big Data Analytics, Dashboards and Scorecards, eDiscovery Capability, Collaboration, Cloud-Based Reporting Services, Cloud-Based Data Synchronization, Hadoop Integration, Cloud Storage, Data Warehousing, Analysis Services – OLAP, Power View Visualization, Data Driven Diagrams, Modeling and BI Development, Operational Reporting, Mobile BI. 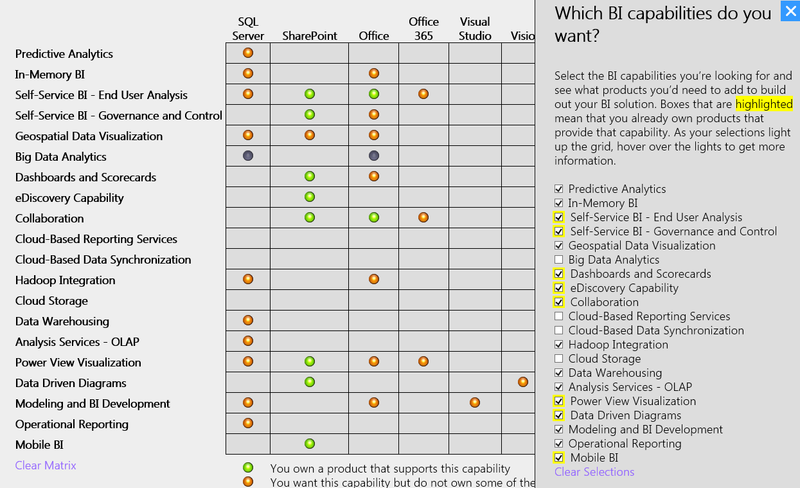 On the third step you will get a report with products currently owned, preferred capabilities, upgrade paths with products and capabilities gained, resources related to preferred BI capabilities, information on Microsoft appliances and resources specific to your industry, use cases, and BI tools.